Sugar and spice . . . not everyone's nice. Fresh from being betrayed by one of her closest friends, new celebrity Jane Roberts has learned a few lessons. Most important: know who to trust. And in Hollywood, that list is short. Determined to get control of her life, Jane swears off boys and all the trouble they bring. But when high school sweetheart Caleb and L.A. crush Braden show up, both acting sweeter than ever, Jane has a hard time remembering her no-boys rule. And for the first time Jane’s best friend, Scarlett, has only one guy on her mind: her new boyfriend, Liam. But being on a hit reality show means hanging out with other guys on-camera, and Liam isn’t too happy with pretending to play a bit part in her love life. Just when everything feels out of control, Jane makes a discovery that changes everyone’s definition of “reality” forever. 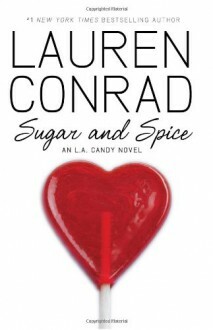 In television star Lauren Conrad’s L.A. Candy series, the drama is pure dishy fun. Perhaps my least favorite in the series. I was disappointed on how it ended, I felt as if I was strung along the whole time. But then again, I do like how it didn't fit the mold of the typical chick lit book. I'm torn.